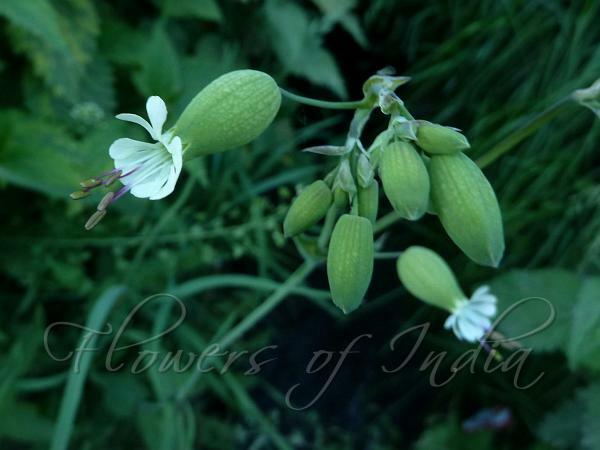 Bladder campion is a hairless perennial herb, with branched stems 1-3 ft tall. The plant is easily distinguished by its few large drooping white or greenish white flowers, with deeply lobed petals, and its avoid, inflated, bladder-like greenish sepal tube with a network of darker veins. Flowers are 1.5-2.5 cm across, usually in lax branched clusters. The sepal is 1.5 cm, enlarging to 2 cm in fruit, with triangular lobes. Ovate to lancelike leaves are pale green to glaucous, 2.5-8 cm long. The capsule is spherical, stalked, incircled by the inflated sepal tube. Flowering: June-August. Photographed in Lahaul, Himachal Pradesh & Valley of Flowers, Uttarakhand.